St Andrew's Church (Presbyterian), Kurrachee [Karachi]. Cost £5300, of which private subscription £2,800. bl.uk > Online Gallery Home	> Online exhibitions	> Asia, Pacific and Africa Collections	> St Andrew's Church (Presbyterian), Kurrachee [Karachi]. Cost £5300, of which private subscription £2,800. 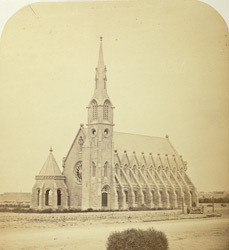 Photograph of St. Andrew's Church in Karachi from the 'Album of architectural and topographical views mostly in South Asia' taken by an unknown photographer c.1870. Karachi, the former capital of Pakistan, is the largest city and main commercial centre of the country and the capital of Sindh province in the lower Indus valley. The Anglican St. Andrew's Church or Scotch Church was completed in 1868. The designer of St. Andrew's was T.G. Newnham, a Chief Resident Engineer of the Sindh Railway. The architecture of St Andrew's seen in this view shows a blend of the Romanesque and Gothic styles. The entrance of the church by means of the octagonal porch shown on the left of this photograph is unusual in its design.